In 1977 - 1978, Mego introduced a full line of toys based on the popular ABC TV series Happy Days (1974 - 1984). The action-figure line included eight-inch-tall likenesses of Richie Cunningham (Ron Howard), Potsie (Anson Williams), Ralph the Malph (Donny Most) and the show's break-out character: the Fonz (Henry Winkler). 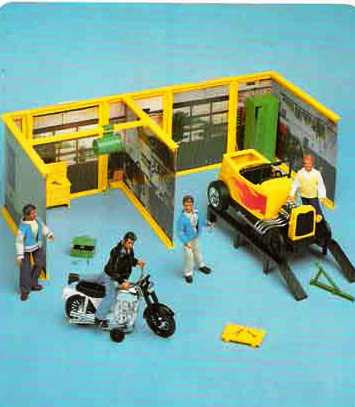 Also released and marketed by Mego were Fonzie's motorcycle, an old jalopy, and this great, over-sized garage playset. The art on the box reads: "AAAAY! The Fonz has a new head mechanic, and it's you with the official Fonzie garage." 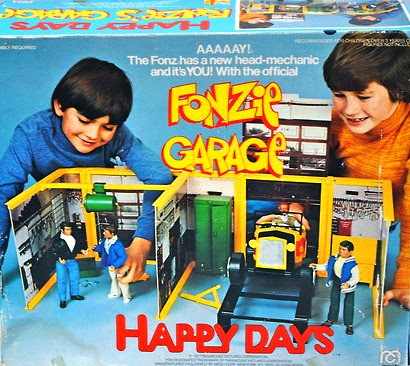 The play-set is remembered today for its backdrop art, which consisted of photographs of a real garage interior, and because it came packed with the (now very rare...) Fonzie hot-rod. It seems odd that in the heyday of Star Wars and the space craze, a TV series inspired by another George Lucas production, American Graffiti (1973) was responsible for so much merchandise, including trading cards, T-shirts, color-forms, and these action figures. The nation was riding high on 1950s nostalgia at the same time that it was getting into outer space action. Below is a toy commercial for Fonzie's beloved bike (from Mego). Being a boy in the '70s was truly a fun time because Happy Days and Laverne & Shirley on ABC Tuesday nights was always part of our family viewing. I had the board game and every kid liked the Fonz. Youtube video says This video is private. Sorry about that.